Space Stations are high-tech structures found orbiting Stars alongside Planets and Asteroid Fields, populated by NPCs, and accessible to the player only via Mech deployment. Any star can have a Station orbiting it, but not all stars do. 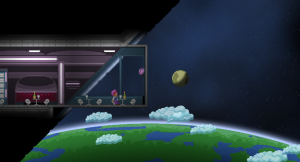 Eventually, the player is given access to the Station Transponder, which allows the player to place their own Station in orbit around a Star, and from there the Station can be expanded and redecorated to the player's liking. 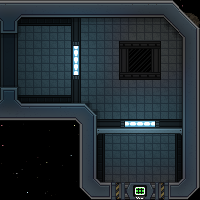 NPC Operated Space Stations are friendly environments populated by NPCs of all player-races. They are a valuable source of new decor items to scan and storage devices to loot (which may include unique decor items), plus they offer unique features for the player. 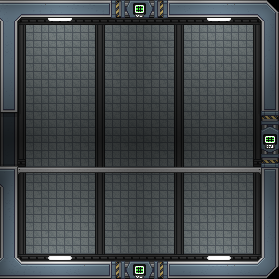 These Stations fall under one of four different types: Food Supply, Medical, Electronic, and Weapon Stations. Each Station has a vendor waiting near a lit sign, selling Station-appropriate trade goods and buying one of the other three types. The vendors buy goods at a higher rate then what they sell, giving the player the opportunity to make some quick Pixels by buying and selling goods across different Stations. Red-armored vendors in NPC Operated Stations offer the "Your Very Own Space Station" Quest. 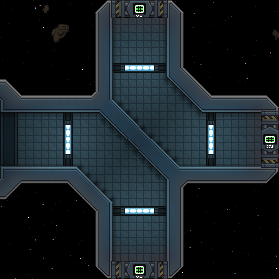 By meeting their trade requirements, they hand over a Station Transponder, which summons a rudimentary -but functional- Space Station into the star system the player is currently in. 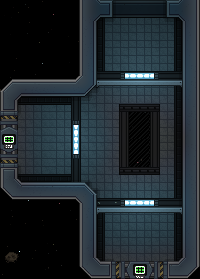 Like the Ark, players may not place items, furniture, or flags on NPC Operated Space Stations. 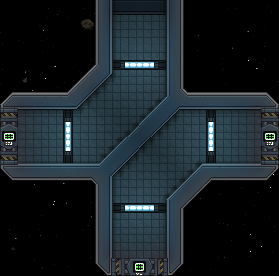 When using the Station Transponder, the player is prompted to choose their new Station's orbital path. This orbit must be clear of obstacles and cannot be too close to a planet or asteroid field. Once a stable orbit has been chosen, the player needs to confirm it and then wait for the new Station to arrive. Closing out the Transponder screen before the Station successfully loads/arrives will cancel the deployment. Once the Station has been successfully deployed, the Transponder is destroyed. If the player wishes to make another Station, they must seek out a Transponder vendor and make another trade. 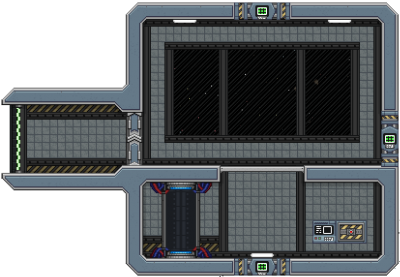 A new player-placed Space Station starts with a single room, with a Mech bay on the western side, and Expansion Slots on the top, eastern and bottom hulls. 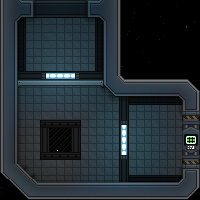 The lower area contains a Teleporter, Space Station Console and an Industrial Storage Locker. The background walls can be removed and replaced with the Matter Manipulator. 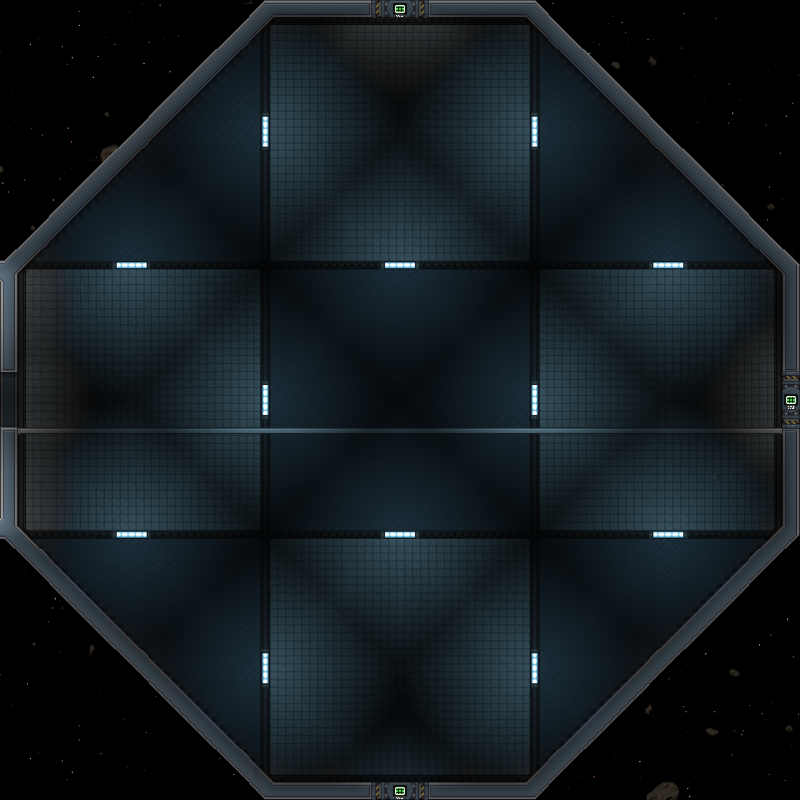 But as with the player's Ship, the outer hull walls and pre-set devices cannot be altered in this fashion (at least, not within normal gameplay means, see below). Players can interact with the Expansion Slots located at the passage points between sections. Rooms which are available to be attached to the expansion slot will be listed and highlighted green, those which can't be connected are highlighted red and sorted to the bottom of the list. Note that an expansion room can only be built if all of its borders connect to matching doors or empty space. 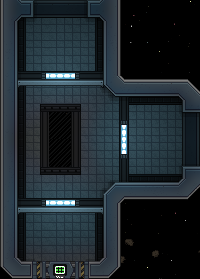 For example, a Core room (possessing doors on all four faces) can not be built in a tile if a horizontal hallway with no lower connection lies above. 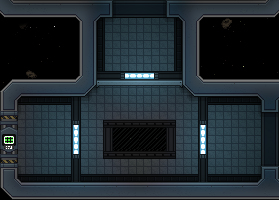 The following table lists all expansion rooms and illustrates their appearance in Starbound. Hovering over each room will display the materials required for construction. As noted, there is no "normal" in-game method of changing your Space Station's outer hull via the Matter Manipulator as you would most other builds. 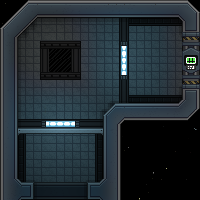 However, by using admin mode commands, you can turn off the protections of a Space Station and alter its blocks normally, allowing you to shape the Station any way you wish. After entering /admin into the chat, you can enter the following commands to allow yourself to destroy the station walls and build outside of your stations. If you want the tile protection back just replace "false" with "true" e.g. If you want to destroy unbreakable objects and the background, you can enter the following command while holding your cursor over the object. 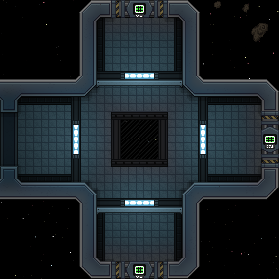 Early concept "screenshot" of a Space Station. 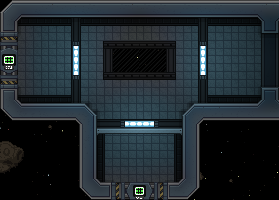 Early in Starbound's development, the Space Station was effectively the player's Ship, an upgradeable structure that the player would populate with crew and creatures to train. The Station was a large area, with room for many players to congregate. PvP was announced disabled on Space Stations, making them 'safe zones'. Tiy originally released a few screenshots of him exploring the Space Station, hinting that it may be added to the game as a future feature. He suggested it would unlock far into game-play for guilds or clans, and allow them to have a "guild hall" type common area. This concept was quickly replaced by the upgradable ships, and the "guild" ideas abandoned. The Bridge was the topmost deck, where the player would navigate the space station to planets using the star map. The hangar originally was designed to house dropships that would ferry players and materials to the planet surface. This was later replaced with beaming. The research lab resembled the area which later became the Apex Facility structure. 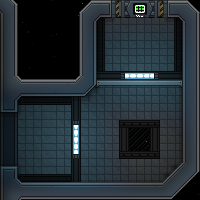 Despite being one of the earliest concepts revealed in the game's development, Space Stations were not put into the game until Version 1.3.0, nearly a full year after the "finished" 1.0 release.